New Door Style Now Available! 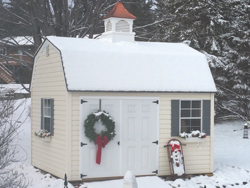 This is our newest model of the Lofted Garden Shed. 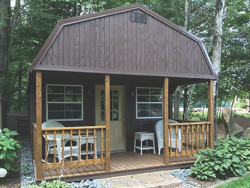 This particular model is 10′ x 16′ with Stonewall Grey LP Smart Siding, white trim and Heron Blue steel roof. Notice the transom windows in the wooden doors – this is North Star’s first building with this feature! You may purchase this building for $3645.00, or choose to order a different size and color options and include this door style. 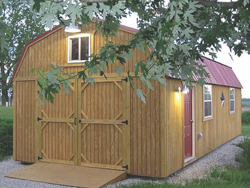 We offer pre-built portable building styles including: Utility Sheds, Garden Sheds, Garages, Lofted Barns, Cabins, and more. 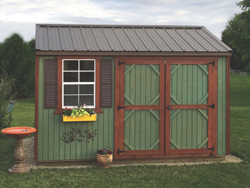 With so many options available you can create the look and style of building you desire. We currently have 15 buildings on site – some are reduced in price for inventory reduction! 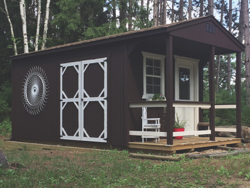 Get the look and feel you desire for your new North Star portable building. 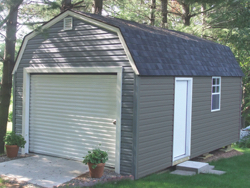 Choose from LP Smart Panel, Mastic Vinyl, or pressure treated siding, and metal or shingled roofing. Many product color choices insure you can create your own unique building and are ideal when blending to existing buildings you may have now. 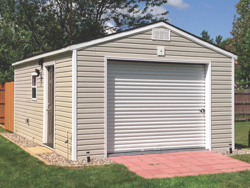 North Star Portable Buildings offers customization options including a package which conforms to the Uniform Building Code (UWC), for an additional fee. This is necessary in some municipalities when the structures are slept in overnight. 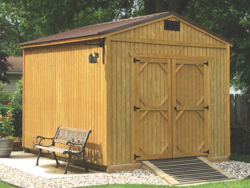 Countryside Portable Buildings offers a multiple building discount when you buy more than one building at the time of ordering. If the size you need is not in the price list, please call, we may be able to accommodate your preference.